Pack sneakers because Prague is a super walkable city and this itinerary is almost all on foot. We walked for a minimum of 8 hours every day. Metro System: It is affordable and super convenient, but be careful to buy your tickets before getting onto trams to avoid expensive fines. I go into more detail in number 28 of my Top 40 Things to Do in Prague post. This itinerary is FULL, so feel free to cut a few things if you'd rather go at a slower pace. Or swap some activities for things on my Top 40 list. Also note: This itinerary is for a Friday to Sunday trip. If you plan to use it for other days of the week please check if things are closed, for example the Jewish Quarter is closed on Saturdays and the National Gallery is closed on Mondays. I also made this guide in November of 2017, so if you are reading this in the future I recommend checking the places hours on your own to make sure that nothing has changed since I posted this. This town square dates back to the 10th century! Take in the beautiful old buildings, grab a tea, and explore the narrow cobbled streets. 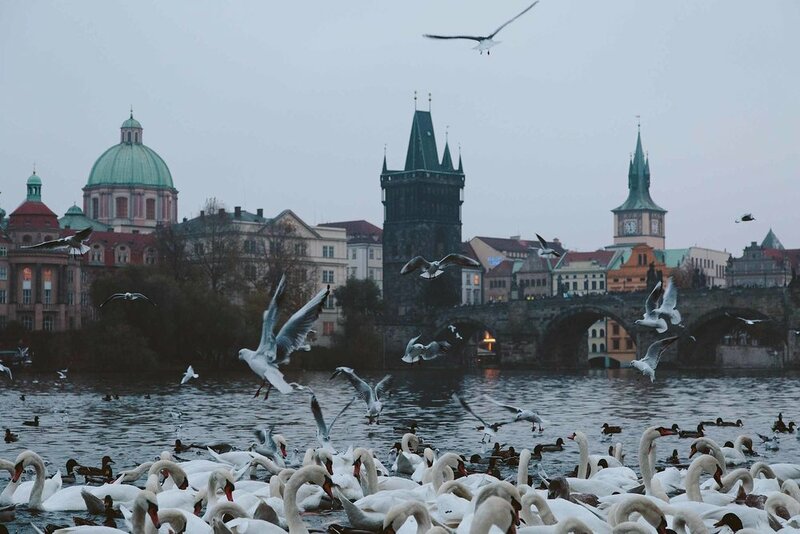 Prague has 17 bridges that cross the Vltava River and the Charles Bridge is not only the oldest, but also the most famous. It connects Old Town to Malá Strana (also known as Lesser Town) and has towers on either side that provide wonderful views of the city. Don’t miss the 30 beautiful statues mounted on either side of the bridge. Yellow Penguins - an installation made by the Italian "Cracking Art Group"
If you want a cool new Insta pic and there isn’t a huge line the Mirror Maze is definitely worth checking out. It does cost an additional 90 CZK though and is quite small and can be very crowded at high season. This place is STUNNING! And closes at 5 PM but is quite small so you can easily see the two rooms in 30 minutes, but I wouldn’t want less than that. It costs 120 CZK and a bit more for a photography pass if you’re interested in using your camera there (people were definitely able to sneak phone photos though without paying extra). If you don’t want to power through your day I would cut one thing off the list so that you can spend more time here. Whenever drinks wrap up head down to Vegan’s Prague for dinner! This place is up a lot of stairs, but it is well worth the hike. We loved their coconut curry with jasmine rice and their Indonesia specialty, but they also have a bunch of traditional Czech dishes if you want to try those! And that wraps up Day 1! I know there was a lot packed in there, but if you managed to get through that you’ve already seen so much of what Prague has to offer. If you still manage to have energy and want a post dinner activity Culture Trip has this post on nightlife in Malá Strana, which could give you some ideas. If you’re on a budget I say skip buying the pass for the castle and go to the South Gardens first. Here you’ll find some of the best views of the entire city and best of all it's completely free. You can enter the cathedral for free and take in the incredible architecture from the entrance way (though you won't be able to walk around without a ticket). Tip: Make sure to get a good look at the stained glass window on the left of the church right after they check for tickets. 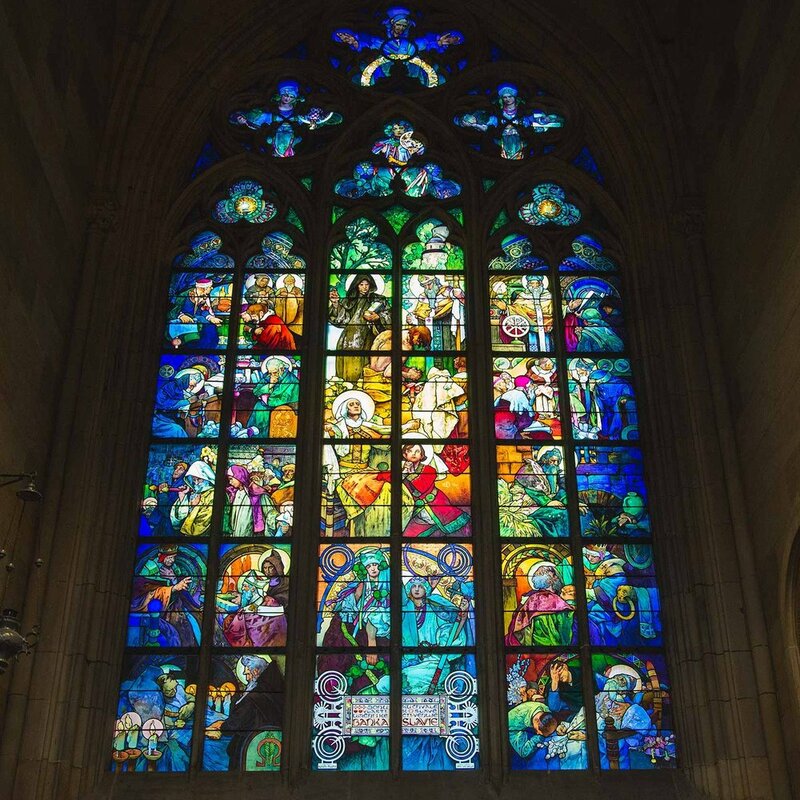 This window was made by Alphonse Mucha, a famous Czech artist. You’ll have to climb 287 steps, but it will be worth it as the views of Petrin Hill and the Charles Bridge are breathtaking. This museum features 19th, 20th, and 21st century art with a wonderful permanent collection featuring famous artists like Auguste Rodin, Camille Pissarro, Paul Cézanne, Paul Gauguin, Vincent van Gogh, and Pablo Picasso. I also really enjoyed their collection of Czech modern art and would recommend you keep an eye out for František Kupka. This restaurant is attached to the museum and has wonderful energy. High ceilings, clean lines, and the perfect amount of plants makes Cafe Jedna a great place to enjoy a meal. We had the grilled veggie and hummus sandwich, vegan samosa, and a banana bread for dessert. This was one of our favorite places in all of Prague. It had such a nice vibe and the people were super friendly, plus a wonderful collection of films! We were there while they had a Bill Murray festival running, so we got to enjoy The Life Aquatic with Steve Zissou. I couldn’t find quality information about this place in English, but there is a place to rent paddle boats right across from the Národní divadlo metro stop and next to the Žofín Palace and this is the website. We loved the falafel plate with babaganoush and their vegan quesadilla, but most important is not to miss the chocolate cake!